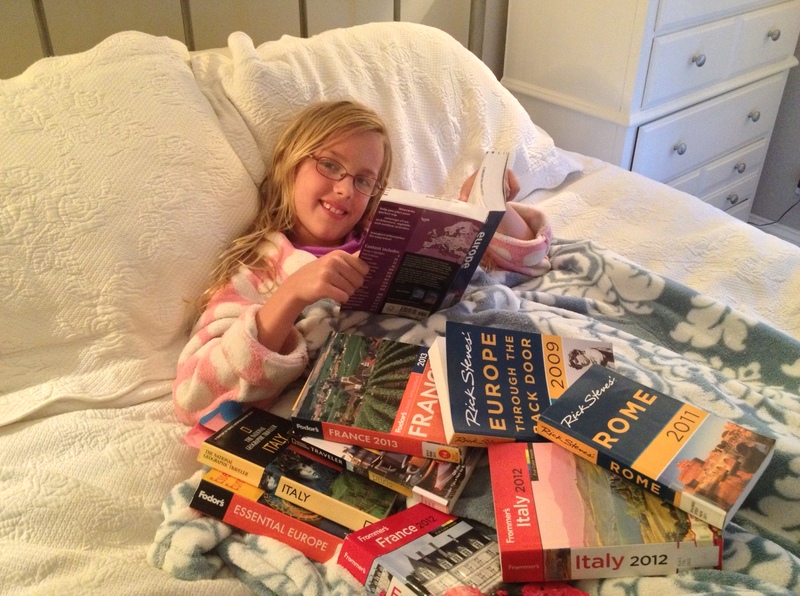 In less than two weeks, I’ll be boarding a plane for Europe with my ten-year-old tiny travel bug, Jordan. I‘ve spent the past four months racked with major insomnia planning and changing, stressing and changing plans some more. I realize the complete ridiculousness of stressing so much over organizing a trip most people would be thrilled to plan. Not me. On top of being an awful trip packer, I tend to show up states or countries away with four pair of pants, one shirt and no socks, I’m also a terrible terrible planner. I bet I could win an award if there was a contest for such things. I’m so bad I actually gave up long ago, deciding instead to just buy a ticket somewhere and show up. I figure it out once I’m there. Traveling on the fly has always worked out for me. I’ve never had to sleep on a park bench or anyplace bad enough to make me change my ways. Rolling the dice and leaving it up to fate (and the travel Gods) works just fine for me. Ok so maybe I’ve occasionally ended up kept awake (despite earplugs) by a snoring German bunkmate in an Irish hostel and once by an equally loud Irish bunkmate in a Spanish hostel, but that’s always been part of the fun, the adventure. Mostly though I end up lucky, getting really nice rooms at the last minute at a third of the normal rate. I’ve met some amazing people in my travels, ended up in places I would have never gone had I planned my trip out and made the dreadful reservations. Traveling alone is easy. This time though I won’t be alone, I’ll have Jordan, my little go-with-any-flow-adventurer by my side the entire time and for the first nine days, husband who quivers at the thought of just winging… anything. His one and only Italian phrase he’s learned is “Mia moglie è pazza,” which means My wife is crazy. Nice. So I’ve been forced to plan this trip- to map out every single place I think I might want to go, even though I really have no idea. I’ve spent an embarrassing amount of hours researching countries, the towns in them, the available rental apartments, the apartments vs. hotels, the owners of the apartments, etc. etc. When I can barely hold my eyes open and feel I’ve reached the end of the Internet’s capacity for legal research, I pull out my credit card ready to reserve. But then, every time panic sets in…. I wake up a million times a night with all the crazy thoughts in my head of all the bad things that could happen to my girl, to me, to my girl if something happened to me. Cancel the whole trip, I think. I can’t do this, its too hard. I put the ten year old in charge. I pulled up a map of Europe and told Jordan to pick out some countries she wanted to see. She didn’t waiver, she just started pointing. And I let her decisiveness give me the push I needed- I took a giant leap of faith and just started booking. So, now Thanks to Jordan there are five countries on our agenda- Italy, Switzerland, France, Germany, and The Netherlands, where we will be staying in an area named Jordaan. Go figure.